Today’s health news is about your safety—particularly in a hospital setting. This is a bit of an oxymoron, considering hospitals are the one place you’re supposed to rush to in times of medical need. But the truth is, medical professionals are human and mistakes happen—that fact is indisputable. In order to reduce the number of medical mistakes that can lead to serious harm to a patient, most hospitals have had to improve their safety records with the use of checklists. The question is: do these checklists work? In one review study, researchers decided to find out if checklists were having a positive impact in terms of patient safety. They found data from nine different studies that included four hospitals’ care settings: the intensive care unit, the emergency department, surgery, and acute care. The nine studies used different safety checklists. The researchers found that most of the time the hospital staff was trained to use checklists. As for patient safety, they discovered that the checklists ushered in modest improvement—not a particularly reassuring conclusion. When it comes to your health, you likely turn to your doctor for treatment and advice much more than you’ll ever need to rely on a hospital medical team (of course, this isn’t true for those with serious, chronic conditions). So what about doctor error in this sort of situation? 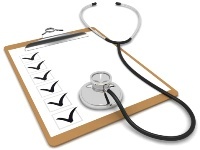 Could checklists help physicians better do their job, if the setting is a doctor’s office? Results are mixed. However, one study determined that the most likely reasons a doctor is going to make a mistake are because of so-called “cognitive biases” and the use of mental shortcuts. A lot of times doctors simply think they know better and jump to a conclusion without systematically going through the evidence gleaned from a medical exam and a patient’s verbal account of symptoms. As for medical shortcuts, time pressure forces many doctors to take these shortcuts, upping the risk for medical mistakes when crucial steps in the diagnostic process are skipped. PLUS: Mistakes that affect patient recovery. Medical checklists outside of the operating room and intensive care unit can target a number of different aspects of patient care. First of all, one checklist can help a doctor assess their cognitive approach and challenge the reasoning behind basic assumptions. A second checklist could help a doctor avoid the most common causes of diagnostic error, while a third checklist could highlight common pitfalls in the evaluation of certain diseases. A checklist approach is something you can discuss with your doctor to minimize the potential for risks in your own health plan. The basic idea behind checklists is to provide an alternative to intuition and memory when it comes to clinical problem solving. This kind of solution could be a great benefit to both you and your doctor—especially when an initial visit causes uncertainty for the both of you and a resolution has to be found within a limited timeframe. Sibbald, M., et al., “Checklists improve experts’ diagnostic decisions,” Med Educ. March 2013; 47(3): 301-8. Ko, H.C., et al., “Systematic review of safety checklists for use by medical care teams in acute hospital settings–limited evidence of effectiveness,” BMC Health Serv Res. September 2, 2011; 11: 211.